Have you ever been lost in a maze, but were having so much fun you did not care? That could be one way how I describe our family's trip to Johnny Morris' Wonders of Wildlife National Museum Aquarium. This place is massive, and awesome, and we all want to go visit again! If you have been following along on Instagram, you know that we went to the Wonders of Wildlife Aquarium over Memorial Day weekend. It was so much fun! Normally I would have posted this Road Trip feature sooner, but I was struggling to figure out how to describe this adventure to you - it was just so overwhelming - in a great way! It most definitely is an adventure destination! First off, the Wonders of Wildlife Aquarium is located in Springfield, MO. It is attached to the Grandaddy Bass Pro Shop that has been there for a really long, long time. 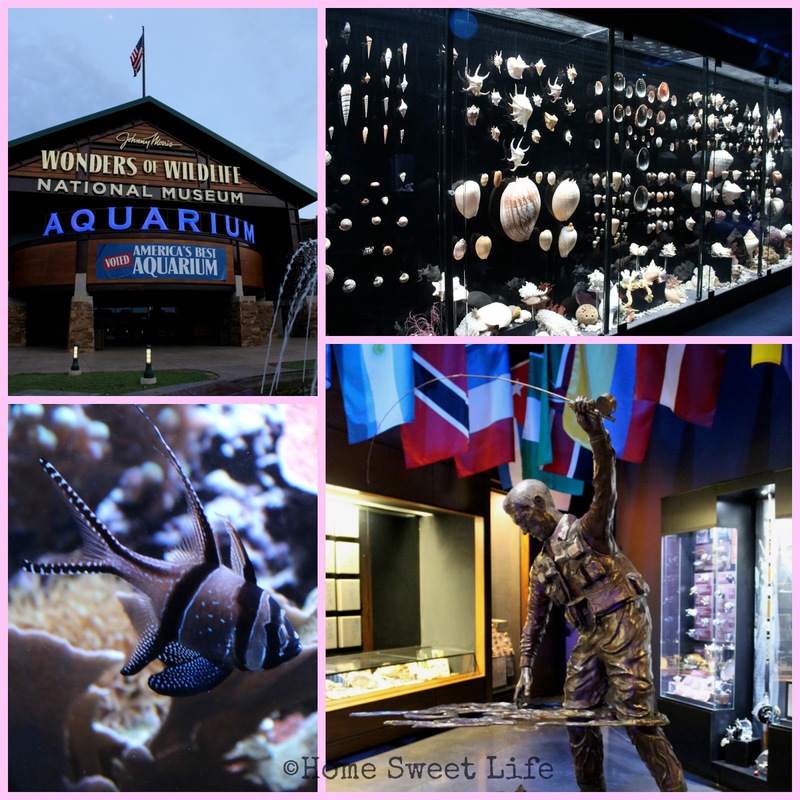 Hopefully you remember our road trip post about the Wildlife Galleries. If not, pause, go read that one, and then hop back in here. Don't worry, I'll wait for you. We heartily suggestion get the combo pass so you can see both the Wildlife Galleries and the Aquarium. If you are seeing both, plan for 6-7 hours. I know, the website says the average journey time is 3-4 hours for both, but I just know you are going to want to spend the day, so get your tickets ahead of time online and choose an early start time so you can enjoy yourselves! They are open 10 a.m. - 8 p.m. daily through Labor Day, then 10-8 on Fridays and Saturdays, and 10-5 the rest of the week. The Wonders of Wildlife Aquarium will be closed on Christmas Day, but they will have extended hours the rest of Christmas vacation. If you can still swing a road trip for this upcoming weekend for Labor Day- super - do it - you'll really enjoy it! If not, start thinking ahead to when you can visit, because this is definitely a destination you want to visit. The Combo ticket for both the Wildlife Galleries and the Aquarium is $39.95 for adults and $23.95 for children 4-11. There are discounts for seniors and military veterans, while children 3 and under are free. FYI - they offer memberships as well, and if we lived closer, we would definitely get one and go often! If you had been touring the Wildlife Galleries, and were continuing your adventure to the Aquarium (like we did) you would have finished with the African animals and gone out the door into a cool, dark blue room, with all sorts of aquatic things, where you would go down the ramp, some illuminated steps, and enter through the front of the Aquarium (top left picture in the collage below.) Don't worry if steps are not your thing, there are elevators! Imaging standing inside of a giant tin can. The walls are made up of a giant aquarium, and the fish can swim wherever in it they want. Up to the top, down near the bottom, switch directions, whatever they want. The top right picture in the collage below is looking up at one of the upstairs windows from the middle of the floor of the room. I could have stayed in this room for at least an hour. So cool! Please go watch this video I posted to get an idea of how amazing this room is! This aquarium is a delightful maze of seeing various huge tanks from multiple viewpoints, plus a whole lot of smaller ones, plus other animals. You naturally are drawn to the next spot, so you don't even realize you're in a maze until you see the same tank from a second (or third) vantage point. While this makes it even cooler than expected, it also makes it a little harder to keep this virtual tour in order. (So if you're one of the lovely staff from the Wonders of Wildlife Aquarium, don't cringe if I get something out of order, just send me a helpful little comment.) Thx! The other two photos in the above collage are of the wall tank outside the Fishing Hall of Fame, and the rays at the bottom of the shipwreck room. We actually visited on Arlene's 18th birthday, and she said her favorite part was "That it was so big and kept going on and on with more cool stuff." She liked all of it! In the collage below you can see the moon faintly shining in the background when we finally exited the Aquarium at 8 p.m., just a part of the awesome room of shells, a pretty pink and black fish I really liked, and just one example of some of the really expressive sculpture work from the museum. In the Fishing Hall of Fame you will see all sorts of cool awards, fishing equipment and photographs. We all really liked the wall dedicated to US Presidents and fishing. Included on the wall is this quote from President George H.W. Bush "It is with a rod and reel in my hand that I tend to count my blessings." Next you will travel to the outside, upper deck level of the cylinder aquarium. This is a unique experience as you can watch the fish and rays from the outside windows of this aquarium feature, and see into the main room where you started. It was really cool to stand just a few inches from rays and fish that were circling the tank. Mesmerizing! Just in case you were wondering, yes, your little (or not so little) kids will see sights that remind them of Dori and Nemo. There is a medium-fish tank with those little silver fish. You know, the ones that made the arrows in Finding Nemo? You get to see them from up above, and again from below. Super cool to see them swirling and moving as a school from both perspectives! Yes, there are clownfish, and anemones, and even an octopus! Next you are going to get your first view of the Shipwreck room. And this is where my memory gets a little fuzzy, because while there is this MASSIVE tank in the middle of this room that you see from every possible height and angle, there are also all of these off-shoot areas, and so, just enjoy your time here, look to your hearts' content, and then call your teens (or your spouse) on their cell phone to find out where they went while you were watching the rays in the main tank or the sparkly piranhas from the pop-up tube! In the collage above (middle right) you can see what I mean by pop-up tube. There are several of these throughout the aquarium so kids (and brave adults) can go underneath the smaller tanks and get a really close look at the various aquatic life. Emily and I both enjoyed these sparkly piranhas. I have had a picture of this particular tank as my lock screen on my phone all summer. The Wonders of Wildlife Aquarium has several tanks that would be considered large at any other aquarium, but because of the massive size of the cylinder, wall tank, and shipwreck room tank, we will now refer to these as medium-sized tanks. You get a lot of viewing time for the medium sized tanks. There are ones with brightly colored tropical fish like the parrot fish above (bottom left) and others with freshwater fish, and turtles. As you are looking across the way from this upper level of the Shipwreck room, you'll see all sorts of fish and rays in the center tank. You'll also look down and wonder "Hey! How do I get down there where people are petting the rays in the bottom pool?" That is a part of this deliciously fun maze mystery! As you finish up your snack and decide to open those doors into the next area, you will find conveniently located bathrooms... and an entire section of other animals. Folks, this place has more than just fish! This might have been one fo Kurt's favorite parts because there were birds of prey (an eagle and some owls), flamingoes, beavers, alligators, turtles, some kind of medium-sized sharks in a tank, and more! This area winds gently downhill and you end up visiting the National Bass Fishing Hall of Fame. This museum part has quite a bit of the history of competitive bass fishing, a room full of lures and memorabilia, and a couple videos. There was a boat too. It was a nice side-stop for us, but if you're really into bass fishing, you'll want to add an hour to your time estimate just for this side-area. Then, on to the jellies! I love watching jellyfish float around. It is so relaxing. I posted a video of just one of the tanks in this area. If I had had more time, I would have spent some of it in here, and let Kurt go on to shark alley without me, He wanted to spend a lot of time in there with all the shark things (jaw bones, videos, etc.) 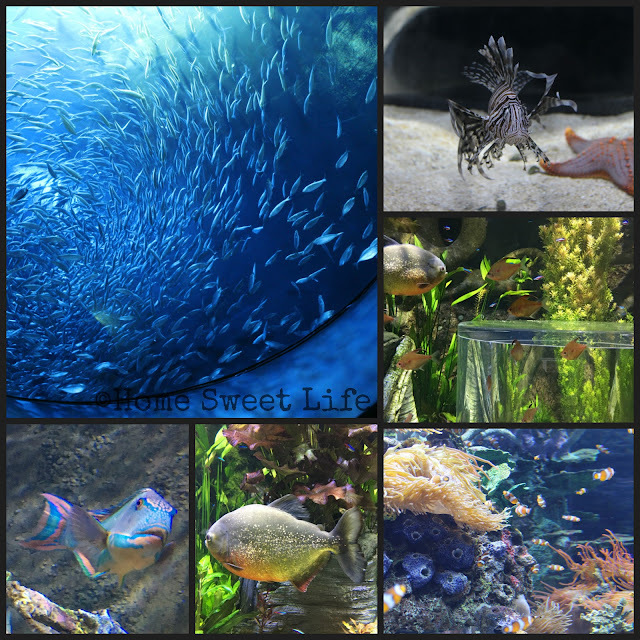 I prefer jellies, but shark alley was really cool too. Maybe you remember the picture up in the second collage of the wall of shells. That is actually a hallway/ room with shell collections on both sides. If you have ever wanted to know what that one shell was that you found at the beach on vacation... it is probably here! Then there are the caves. A really cool walk underneath of tanks that let you look up at fish that you hardly ever see anything but the tops of. You can see the bottom of a longnose gar, a huge catfish, and other cave or bottom dwelling fish. You can also walk alongside the tank with the arapaima, an Amazon freshwater fish that Emily has liked for years. The arapaima in the tunnel part of this caves area was only about 6' long, but it will keep growing! Just when you thought you might be underground forever, you turn a corner and find yourself looking out a cabin window. And looking at the fuzzy face of a bear! I told you there were more than fishies here! I'll have to go find that short video and post it on Instagram or Facebook for you to see soon! Shortly after the bear encounter, you arrive back at the bottom level of the Shipwreck room. Here you can talk with the staff and ask them your questions about the fish and rays in the main tank, or you can pet the rays swimming in the bottom pool. These rays have all had their barbs removed, so just follow the instructions from the staff and be gentle when you pet them. Are we done yet? Almost! 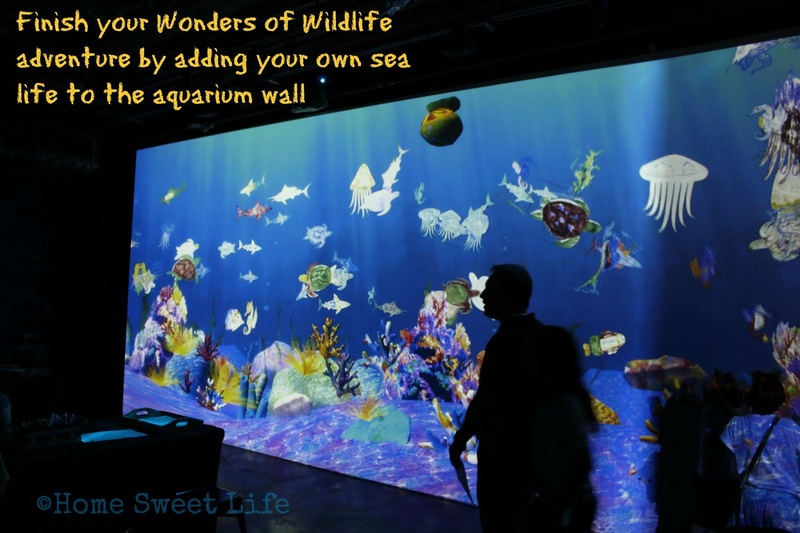 The very last area before your adventure at the Wonders of Wildlife Aquarium ends is an interactive area with a green screen wall. You might have glimpsed this from the upper level and wondered about it. It s a fascinating area for kids (and those brave adults) who want to draw a picture of one of the aquatic animals they saw today. Then the staff scans your picture into the computer and your creature ends up in the virtual tank along with the other sea life drawn by today's visitors. You get to take your drawing home, but everyone gets to enjoy watching your sea life swim around the virtual tank wall. The technology to have this happens is way beyond my understanding, but super neat! Your fish, shark, turtle, seahorse, jelly, etc. gets to join in this screen tank adventure and you can watch it travel all around. How much fun was this road trip? Tons! We were probably only halfway through when Em called one of her friends and said, "you will not believe how cool this place is, we need to get (their other friends) together and make a road trip out here!" By now I hope you can see that this aquarium adventure is worth way more than the cost of admission. 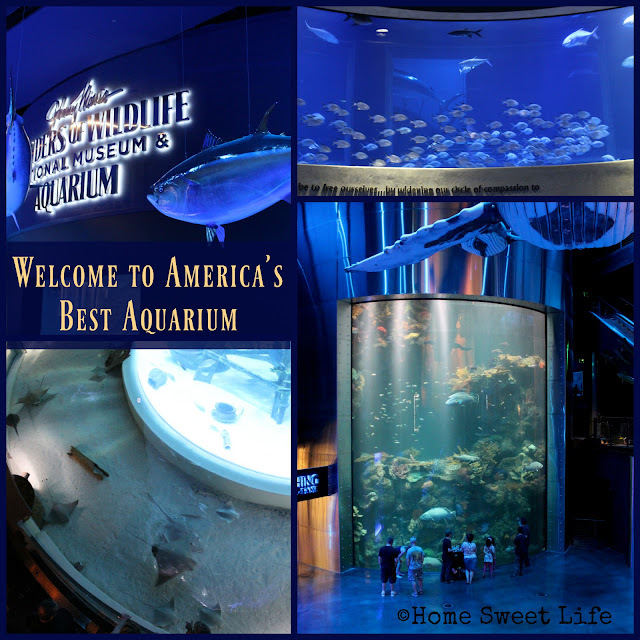 All of the staff were super friendly, from the admission desk to the horseshoe crab petting tank to the final virtual aquarium wall and everywhere in between. I could tell they enjoy working here, and that always makes it more fun! If you are looking for a place to stay while in Springfield, Bass Pro Shops has a hotel called the Angler's Inn. We did not know about it before this trip, but we have decided to check it out for our next adventure to Wonders of Wildlife. The rates are comparable to other local hotels, but this one is right across the street from Outdoor World and the Wonders of Wildlife experience. The rooms are done in Bass Pro Shop style decor. Plus, I want to see their pool, where the walls were painted by some of the same guys that did the paintings for the museum! If possible, plan to visit Wonders of Wildlife on a weekday, when the crowds tend to be smaller, and you can spend more time gazing at the wildlife and sea life! If not, know that the timed entry is a great thing so everyone can enjoy their adventure. Buy your tickets online and choose your start time. 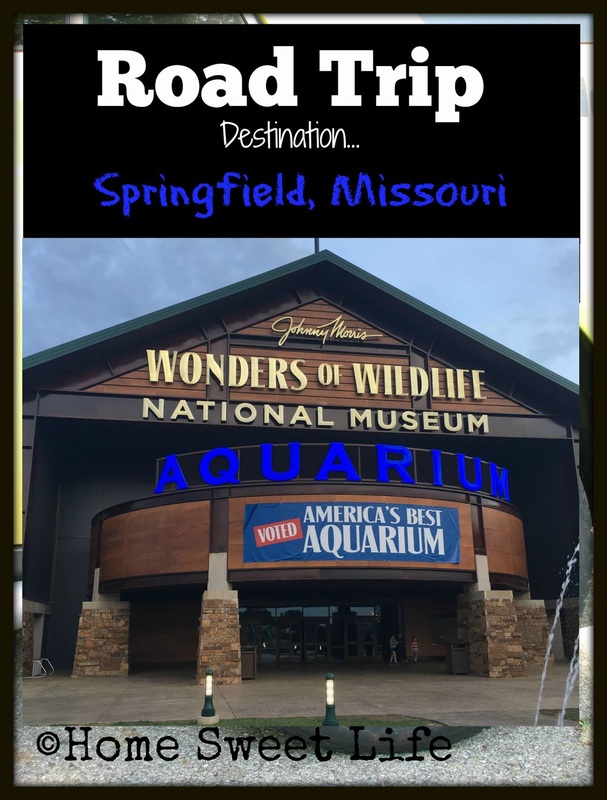 Get ready for your next road trip, and head to Springfield, MO, to visit the Wonders of Wildlife Nation Museum and Aquarium. 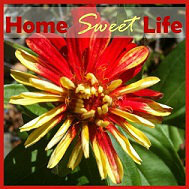 Tell them you heard about them from Carol @ Home Sweet Life. 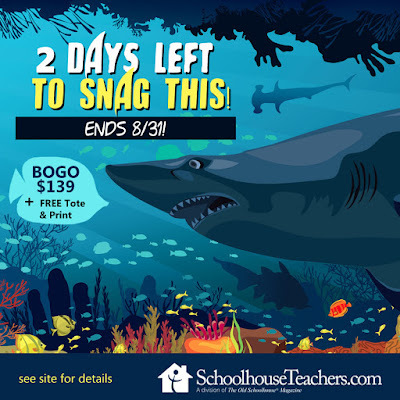 Did you realize that this is the last week for the BOGO sale at SchoolhouseTeachers.com? It is! The sale only lasts through this Friday night 8/31/18. Why should you care? 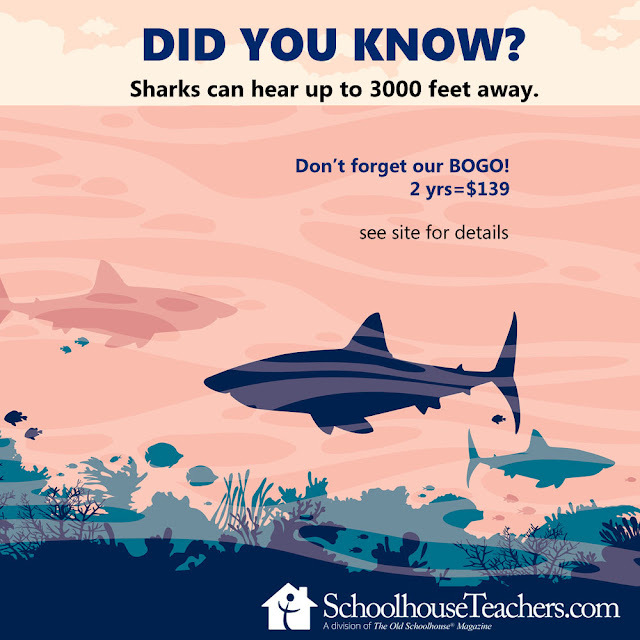 Because this one website can provide almost 400 courses to choose from for your family with no additional per-child fees. Plus, I know a bunch of you are looking for a new planner for this school year. Maybe you like to plan everything out for the entire semester for each kid. Maybe you'd rather just plan a week at a time. Or maybe, like me, you have overall goals to reach, but you need a handy place to write down what you do each day towards accomplishing those educational goals. Whatever you planning style, either the 2018-2019 Schoolhouse Planner, the High School Schoolhouse Planner, or the Molly Green Lessons from Home planner will help you get and stay organized on the planning/ recording front. IF you have a high schooler, I'm going to recommend you check out AppleCore Recordkeeping, which comes with your membership to SchoolhouseTeachers.com. It is really simple to use, and my program of choice for making high school transcripts. Simple and effective - two words that are golden when describing transcripts! Want more info on the sale? Click on any link here in this post. To read more about how we have used SchoolhoouseTeachers, just type schoolhouse teachers in the search box in the right margin near the top of the blog! Last Friday's word prompt was loyal. I realize it's Monday now, but humor me ok? It's been a long month. 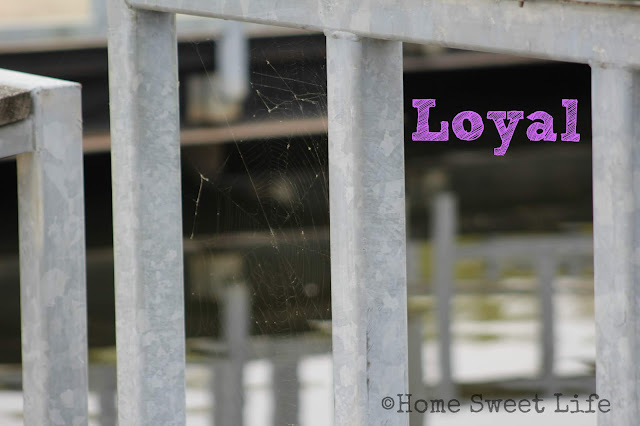 Loyal is a word most often used in the world of sports, or when describing a dog. Sports fans are loyal to their team, and cheer for them even when they're having a bad year. Most dogs are loyal, that's why they're dubbed "man's best friend." But what about you, are you loyal to anything? Maybe the word you use instead is faithful. I do not remember reading the word loyal in the Bible, but that doesn't mean its not there. I do know the word faithful is used a lot - especially to describe God. God is always faithful. Even when we are faithless. It is going to happen someday, you're going to be faithless. Either because you did or said something that denies God's involvement in your life, or because you feel empty, faith-less. What happens when you hit that day? 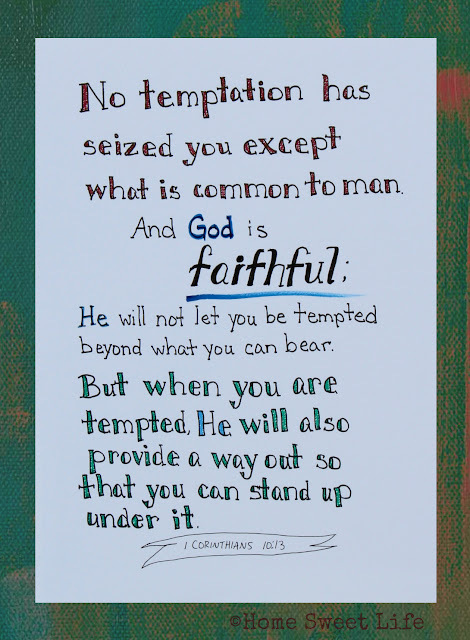 God remains faithful. He loves us no matter what. That is a comforting thought. When we fall down, He picks us up, cleanses our skinned knees, and encourages us to keep going. I hope you are faithful to your friends, I hope you are faithful to your family, and most of all, I hope you are faithful - loyal - to God. On those days when you struggle, when you feel empty, faith-less, look back at all the times that God has been faithful to you, and be encouraged, He will always be there for you. Have you ever wondered why some believers seem so in step with the Holy Spirit in their lives, while others struggle so mightily to understand who this Helper is supposed to be? I’ve been on both sides of that questions at various times in my life. 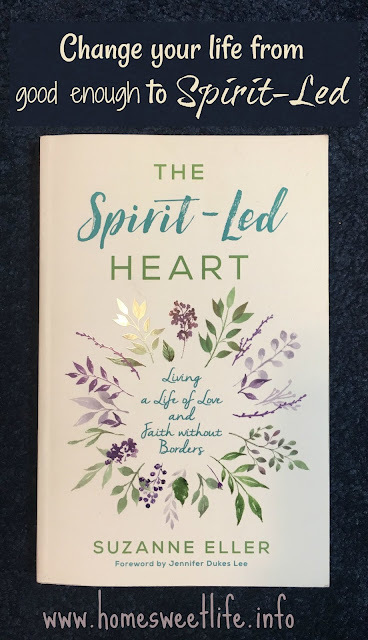 That is why I jumped at the chance to review Suzanne Eller’s new book, The Spirit-Led Heart. I wanted to see if she could put those lessons about Who the Holy Spirit is and what He does in our lives into layman’s terms. The simple answer? Yes! For too long in my own life, I had heard about the third person of the God-head, but never really understood his position, or his power. Too often the church as a whole gets caught up in debating whether or not the gifts of the Holy Spirit are for today, instead of focusing on HOW the Holy Spirit works in our lives. Thankfully, in the past two or three years, there has been a recognition of the Holy Spirit at work in the teaching and preaching within the church in the United States that was sorely lacking for most of my adult life. Suzanne’s book is a refreshing look at how the Holy Spirit helps us live our faith. These ten chapters each focus on one of the ways the Holy Spirit leads our hearts and shapes us to be more like Christ. For each of these areas, such as Chapter 3: We Will Live in Truth, Suzanne gives examples of the Holy Spirit at work, either in her own life, or in the lives of one or more of the many women she has ministered to over the years. Then she takes the reader back to how the Holy Spirit worked on that trait in the early church, and then brings us back to understanding the working of the Holy Spirit in our own lives. Each chapter ends with a Scripture verse to remind us of the truth, a promise, and invitation to have the Holy Spirit work in your own life, and a prayer. Normally I can read thought a book like this (about 200 pages) in a month and summarize my thoughts pretty quickly. Not so with this one. It came at just the right time, when God had been whispering to me through various other avenues - like sermons at church - about how the Holy Spirit had some work to do in my life. This book challenged me to be listening for the Holy Spirit's promptings in a way I had not been doing for far too many years. Sometimes, the raising of our children causes us to stop listening well, when it should be causing us to cling to every whisper the Holy Spirit is uttering. I highly encourage you to get yourself a copy of this book, either in print (my favorite) or e-book version and take that small step of faith in releasing your grasp on living a "good enough" life and move into a Spirit-Led life. I received a complimentary copy of this book from Bethany House in exchange for an honest review. All opinions are mine. I was not required to write a positive review. I am disclosing this in a accordance with FTC regulations. 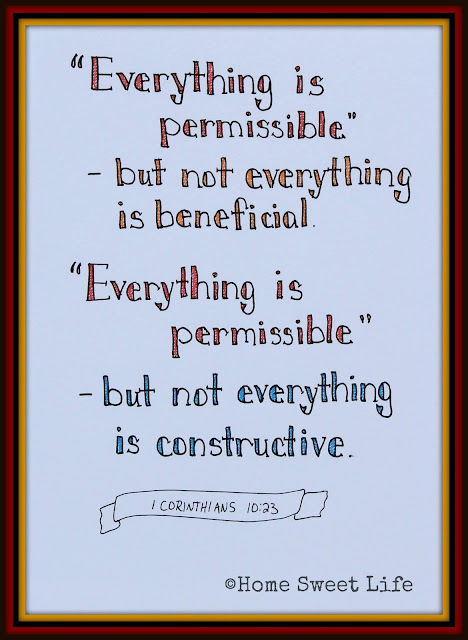 Today is Friday, which mean I should share some of our all time favorite homeschooling things... hmm. 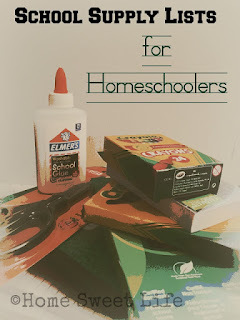 Two years ago I wrote about school supply lists for homeschoolers, I think maybe you should start there. I'll tell you why we love back to school time - because all the school supplies are on sale. You seriously need to get your children (and yourself) some quality scissors now when they're on sale. We really like Fiskars scissors. They come with sharp blades that stay sharp. You're more likely to have your child outgrow them than for the blades to get dull. Arlene says her favorite part of homeschooling is getting to take an afternoon nap - even as a high schooler! We have had a lot of fun homeschooling for the past 15+ years. One of our favorite resources is our library. It is a huge treasure trove of learning, with some pretty awesome librarians, and as much time as we have spent there, we still enjoy going whenever we can fit it in. When the girls were first reading, especially for Emily, we would go every week and get about 25 easy reader style books to keep her busy. Henry & Mudge and Mr Putter & Tabby were two of our favorite series. One great online resource we were introduced to a long time ago is AmblesideOnline.org. If you are wanting to know more about Charlotte Mason's style of education, or of you need help planning things out for the year, OR if you're like us and just wanted great ideas for living books, it's a great place to go. Many of the inter-library loan books we have checked out have come from the book lists here. While just reading the books on the list does not constitute a Charlotte Mason style of education, it is a wonderful place to start. There are two other online resources we recommend. One is SchoolhouseTeachers.com. This site has such a vast variety of options to choose from it still surprises me. 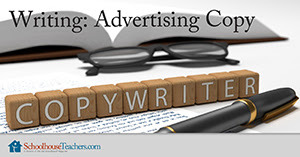 For instance, did you know that Sharon Watson has a short three week long class on there about writing advertising copy? I think I'll take that one soon. One of my friends suggested I take a look at it. Sharon Watson is a superb teacher, and a wonderfully nice human being, and we have enjoyed all of her writing courses our girls have used. I've decided to try this one myself. It should help me when I get around to writing our my book proposal for submission, as a book pitch is a specific type of advertising. What are some other favorite of ours? 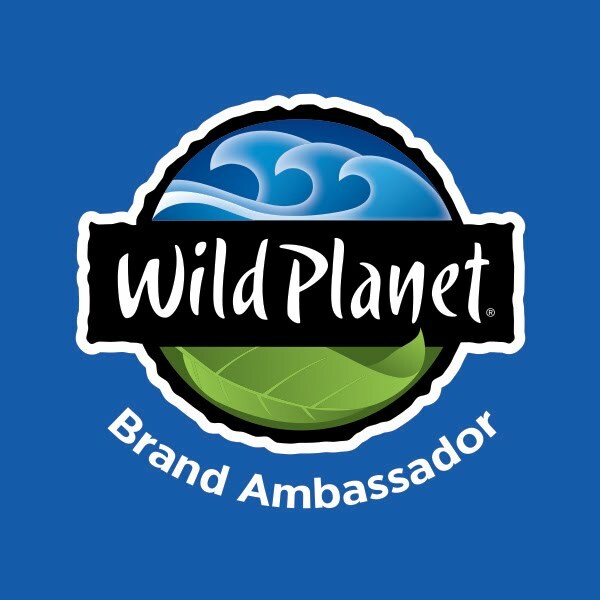 Foods: pizza, tacos, Wild Planet tuna, watermelon, and blueberries! Music: For King and Country, Classical, Keith Green, and so many others! 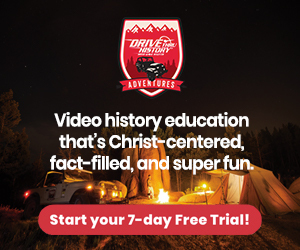 Road Trip destinations: Pittsburgh, PA, Bartlesville, OK, Springfield, MO, Chicago, IL, Cincinnati, OH, Conner Prairie, and the Indiana Dunes. 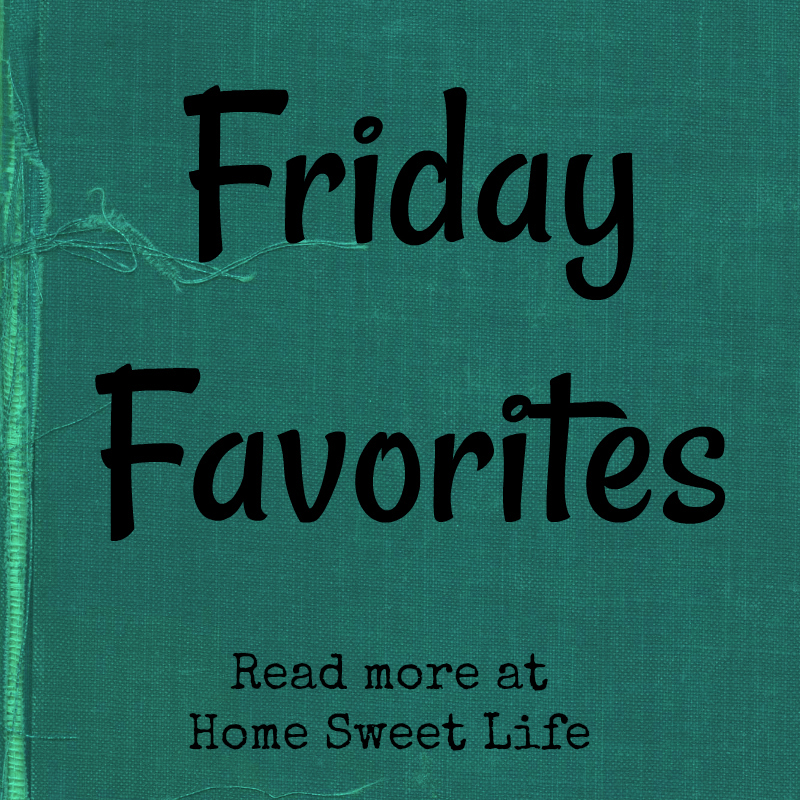 I know, today has been a really random collection of favorites, but hopefully, it has given you some ideas to check out! There are a lot of reasons for us to be thankful today, but here is one of the biggest ones: we are together! After having both girls at the Indiana State Fair for the past month, it is really great having everyone at home again. I know that a lot of our friends are looking forward to being "empty nesters," and I understand why, I just know that we still have a little while to go before that happens. This is a picture of the 4-H complex, on a not-busy day. This is where our girls spent most of the past month. Now they get the joy of putting their bedrooms back together. Oh yeah, and they need to wash a bunch of laundry. Arlene has one semester left of high school. Just one. After 15+ years of home education, it is drawing to a close. It will be a full semester for her, but I know she can accomplish what is still needed before graduation in December if she sticks to it. What's left? good question, and one we will look at next week as I finally get some lesson planning done. We never start until the Tuesday after Labor Day, so why change that now? We are going to enjoy this last week and a half together - not thinking about schoolwork. Summers are short enough, so today we are thankful for these last few days of freedom. 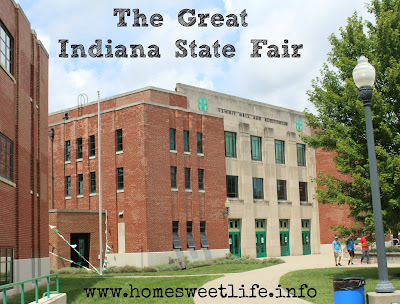 And truthfully, I'm thankful that the Indiana State Fair is over. It was a wonderful 17 days, but I'm still a bit tired from all the fun. Why yes, that is Arlene pretending to drink out of the maple syrup bottle. We all like maple syrup for our pancakes, and I'm pretty sure she was trying that day to convince me to buy extra of her favorite grade. Don't worry, we bought plenty! Life can get crazy at times, so take every moment you can when it is calm-er and be thankful. Then when it gets crazy, remember to be thankful for the people you have in your life. Emily just began her second year of college yesterday. Nothing like coming home and jumping right in. As I was getting ready yesterday morning, I took the time to thank God for all the wonderful things He has blessed us with. There have been really tough times, and some easier times. What never changes is God's faithfulness. He is the same yesterday, today, and tomorrow. Be thankful, and share your joy - someone needs that sparkle in their lives today! What do you struggle to work into your day? Is it getting your kids to take their vitamins? Having more than one field trip a year? Maybe you're struggling to fit in art or music, because in your mind it needs to resemble what you did in school 20 years ago. Today's Back to Homeschool Blog Hop topic is working things in. Even moms who send their kids to a school building five days a week struggle to find time for everything, so feel free to invite those friends to read along with you today! We don't plan to fail, we fail to plan. This maxim is usually used in business, or in relation to our finances, but maybe, we need to use this wisdom for our homeschools too. Having a plan, or a routine, does not mean you're not trusting God, or that you've succumbed to a rut. Having an overall plan for your homeschooling year is a great idea, even if you don't make a daily or weekly plan. Being flexible and able to work with your plan means being open to when God changes your plan for the day. As our girls got older, these would turn into lists of books or topics I wanted to either purchase or check out from our library. There were several older books we borrowed through Inter-Library Loan, and sometimes those would take a while to get here. I'd request them early (like a month before I thought we would want them) and if they arrived sooner, we would just skip ahead to that book and then return to whatever we had been working on beforehand. Sometimes the book would come from the University 2 miles away, and sometimes it was from two states away. When the time approached for Emily to begin high school, I knew we would need more specific plans. Transcripts are not difficult to make, but many parents dread them because they feel inadequate to the task of teaching high school level courses. Personally, I never really felt like I could not teach her any of the high school courses, but sometimes, I did not want to. That's where having taught her how to learn became vital to her education. Some of Emily's courses were done online, some from traditional textbooks, some in group settings, and some were done from a compilation of resources I told her to read and then write me a paper about... and then there were all those credits she earned while working at Conner Prairie as a youth volunteer. Here's my take: Emily worked a minimum of 120 hours each year in the youth volunteer program. Some parents never gave their homeschooled kids any credits for the work done there, but I knew it was real work and real learning, so I devised a plan to grant her the appropriate credits. Our state's Department of Education has this gigantic PDF posted on their website that has course descriptions in it. I downloaded it and got to reading. The original idea (I think) was to have this listing so schools from the various parts of the state could be calling a similar education by a similar name: i.e., Indiana now grants credits for art based upon the type of expression or medium used. So, if you went to school in Vincennes, then a 2D art credit should cover roughly the same materials and topics that a 2D art course taught in South Bend covers. They used to be called Art 1,2,3,&4, but now your credits might be: photography, 2D art, sculpture, fiber arts, and choir. Make sense? As I read through the various pages (I had it printed and three hole punched at the local sprint shop for about $25) I would put a post-it note by courses that I thought might line up with what Emily was already doing. At Conner Prairie she was in costume (acting) a lot, so I read though all the acting and theater course descriptions until I found the one closest to what she was already doing, and then counted some of her volunteer hours for the year towards that class. There were a few times when I added a few at-home activities to what she had been learning to round it out to what I believed to be an equivalent education to the courses listed. Sometimes she had already done more than the course listing. Some years she volunteered about 200 hours, so she accomplished more credits from hands-on learning those years. As Arlene approached high school I continued along that same vein of thought. When there was something that she really wanted to do, and would do regardless of if she got credit for it, I went searching to find something similar in that big PDF. Sometimes the state didn't have anything similar, so I called it what I thought best and stuck it under "electives." But what if you're wondering how to work in something else. Vitamins, healthy food, outdoor time? Think about which battles are easiest and which are hardest, then think about which things are the most important overall. I would much rather my child be healthy and have a strong moral character than have the best handwriting or be the fastest at math, wouldn't you? So how do we get there? First, think about health. We always take our vitamins first thing in the mornings. The first one out of bed takes their vitamins, and then they get the honor of the first hot shower. :) Our kids rarely did their schoolwork in their pj's - sorry, not all homeschool stereotypes are true. As a 2 job family, Kurt and I felt it was important that they learn to get up and get themselves cleaned and dressed every morning, regardless of who was the parent at home that day. This really did help them transition into getting more done in the mornings. Do you struggle to fit in PE or time spent outdoors? Pack your lunch into a basket and grab a blanket. Read outdoors, do your kids' math lessons outdoors, or practice math facts while jumping rope. Since our girls needed two semesters' worth of PE for high school, we made them keep track of their hours spent exercising. They had a paper on the wall of their room, and every time they went hiking with friends, we played tennis at the park, rode our bikes or went to the pool, it was their responsibility to write it down. Once they hit the benchmark of hours, I wrote down a credit for PE. You know, that high school biology class is going to be way, way easier to understand if your children have spent time outdoors, growing some sort of vegetables or flowers, and hiking through the woods. Make it a point to spend at minimum one afternoon a week outdoors. You will feel better, your kids will get back their natural love of exploring, and everyone can at least get exercise by running around in your yard or at the park. If you're looking for outdoor ideas, you can check out some of my past newspaper articles, my column focus on getting families outdoors year-round. One more thing for Work it in Wednesday: field trips! When did you last go on a field trip? For us, that was last week, unless you count today's stop at the gym to play in the pool. 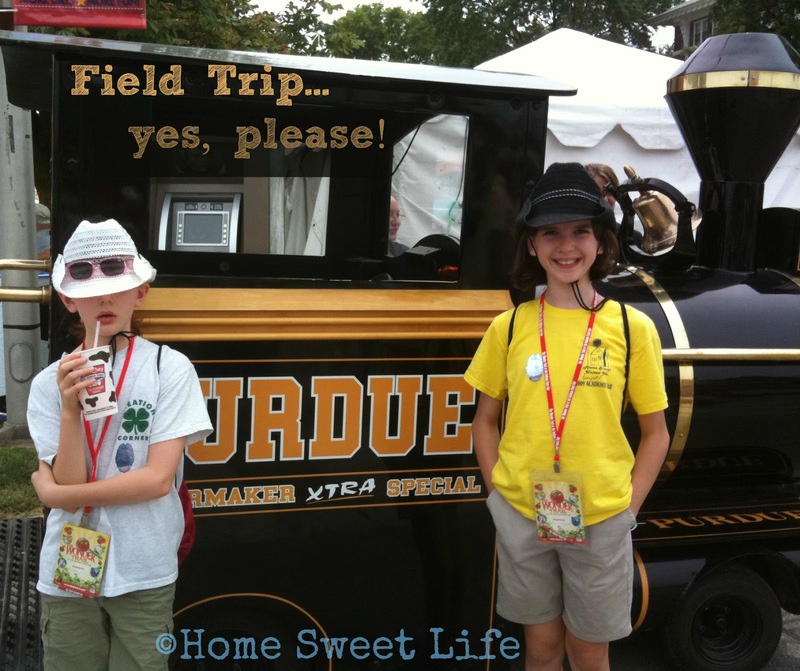 Do you think too much when planning a field trip? Does every field trip have to be educational? What if you just planned to have fun and let the learning happen naturally? We often look things up before we go on a field trip or vacation, but I don't think I've ever made the girls write a report about it later. That's just SO boring! I know there are state standards that public school teachers try to meet with every field trip, but relax, you're a homeschooler! Your kids will learn just as much about money at the laundromat when your washer breaks as they will by taking a trip to the local bank for a scheduled field trip. It may not be the same information they'll learn, but since they're both about money, why not make both fun? You can study art history for weeks before you visit the art museum, OR, you could just go and see what interests your children. If something really sticks in their mind, you can look up more about it after you get home again. The fun of field trips is supposed to be because they're different. So be different! If your kid is interested in airplanes, ask your friends if anyone knows a pilot, or a baggage handler, or a stewardess who lives locally that you could talk to. Maybe your child loves horses, call your local extension office and ask if there are any local 4-hers who would let you come visit their barn and ask questions about their horses. Field trips can be super inexpensive, just focus on fun, and learning will come alongside at your child's pace. Maybe I should have called this blog: the $5 field trip. When that's all you have, you learn to be creative! 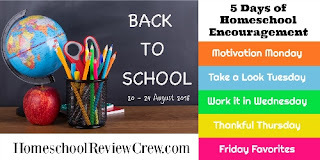 Check out all sort of other ideas for working in electives, finding a specific course for your child, or learning how to learn alongside you kids on the other posts in today's blog hop. Just click on any link below and have fun reading! Would you really like to take look at what we use? Some of you are probably jumping up and down saying "YES!" Others might be like, umm, no, I don't want to know, I think I like my curriculum. Let me tell you a little secret: either answer is fine! We have never been a big curriculum using family. We prefer living books over textbook style learning, so the thing we use the most is our library card! Our house currently has 15 bookshelves with books (as opposed to records, CDs or DVDs) on them. We have a medium-sized really old house with a lot of windows, so we have squeezed in bookshelves of all sizes. But what I think might help you more is to tell you about what we actually used as far as curriculum style resources these past few years for high school. As far as we are concerned, it is still much more fun to learn things hands-on, but every once in while, a good curriculum can come in really handy. Especially if you are working and homeschooling! 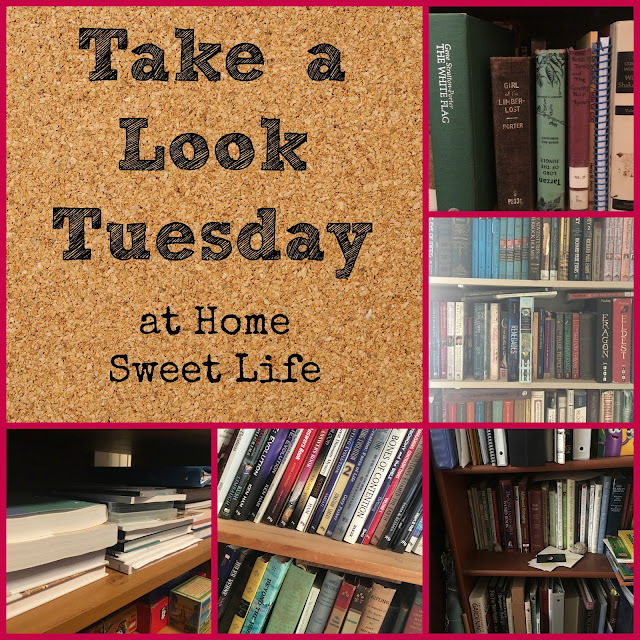 Remember, we have had 2 girls homeschool through high school, so this is a combination of resources from both of their paths. (Don't be overwhelmed!) Some of these we used all the way cover to cover, others were the spine that let us jump off onto the topics that interested the girls the most. One of the things I like best about SchoolhouseTeachers.com is that it changes over time. Emily was using a physics curriculum that she really did NOT like, so I searched on ST and found one for her to use instead. What is there now might not be there in two years, but if it isn't, that's because something else cool is there instead. Have you looked at the BOGO sale that's going on over there this month? It really is a great resource to have! So what does a typical day look like for Arlene, now that she has one semester left? Good question! It usually starts with some reading (history, Lit, or science) is mixed with a big helping of housework or handcrafts, and ends with us working on math, discussing politics, Religion, or textiles. 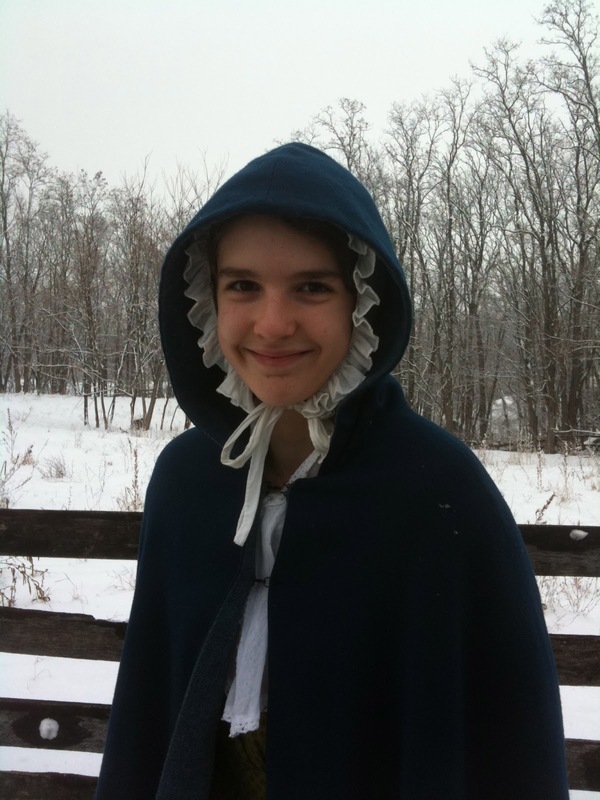 Every couple of weeks she works on creating her Books With Bean columns, and she volunteers about three days a month at Conner Prairie, a living history park, where she works both in costume, and in the textiles program. By the way, if you were wondering about Books with Bean, she has been taking a couple weeks off while she was working at the Indiana State Fair. Her column will be back in September, but will switch to twice a month instead of weekly. For myself, there are no typical days. I'm ok with that, because I know that God always has something planned for me each day. Right now I'm averaging three days a week at my merchandising job, but I also write a monthly column for our local newspaper, and write for the Homeschooling with Heart blog. Why is my life so full? I dunno. My mom joked a few years ago that I do as much things as six "normal" people. I love my mom's dry sense of humor - "normal" people must have quiet, dare I say, boring, lives. I would really like to get more words out of my head and into the computer for my book, but that is a work in progress that didn't progress much this past month while I was covering the state fair for the local newspaper. Maybe September. That sounds like such a lovely thought, time to actually write! Every homeschooling family I know does things differently. That is one of the beauties of home education, you really can tailor it however it best suits your family. For us, that's more discussions than writing papers, it's more time spent outdoors and less time watching tv, and it's always, always looking for a reason to take a road trip somewhere cool. We don't do "school" here, we raise lifelong learners, and point them to Jesus. So do your thing - your way. 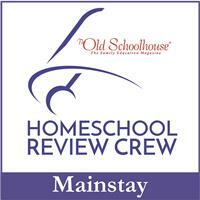 Check out how other members of the Crew do home education for their families. Just visit some of the links below. 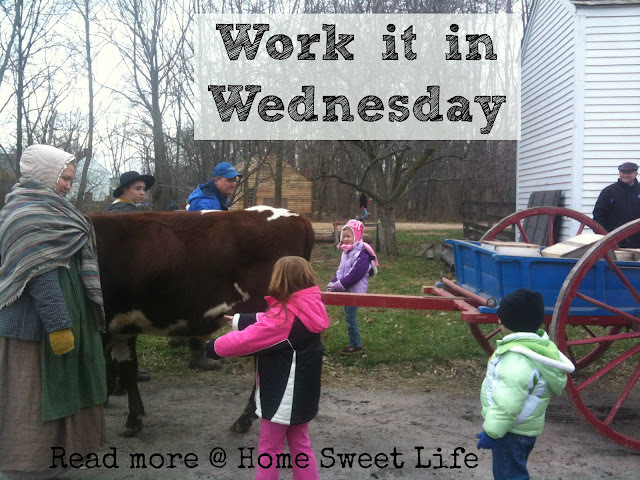 See you tomorrow, I think you will really like Work it in Wednesday!